October is here and visitors can already see the first signs of fall foliage in the high elevations of the Smoky Mountains! However, when the vibrant fall colors arrive, huge numbers of visitors are sure to follow. 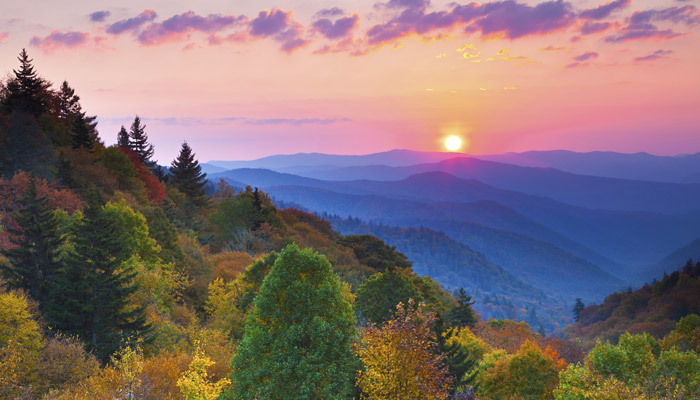 In 2016, over 10 million visitors experienced the Great Smoky Mountains National Park. Since summer and fall see the biggest visitation numbers, the park can get especially crowded when the leaves start showing their brilliant colors. 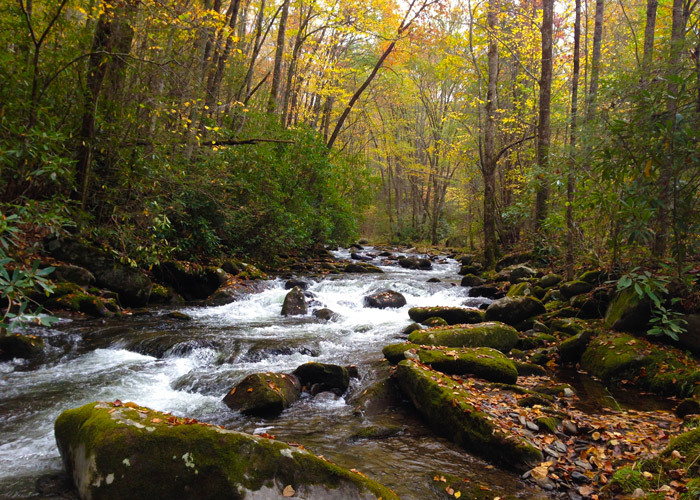 Unfortunately, sometimes these big crowds can get in the way of truly enjoying your fall vacation in the Smokies. So how can you make the most of your October trip to Gatlinburg, TN? We're here to help with a special fall hiking guide to help you dodge the crowds, find beautiful autumn colors, and explore the best parts of the Smoky Mountains! Arriving at the trailhead before 10 AM is a prime way to beat the crowds this time of year. While it can be difficult to rise with the sun, you can always reward yourself with a delicious doughnut and coffee from the Doughnut Friar, a local favorite that opens at 5 am daily. If you're visiting in the first two weeks of October, much of the fall colors will only be in high elevation areas near the Tennessee/North Carolina border. To see leaves at this time, you'll want to drive up US Hwy 411 to Newfound Gap or Clingman's Dome. However, in the last two weeks of October, peak fall will arrive in lower elevations inside the national park. This includes areas like Sugarlands, Elkmont, Tremont, Cades Cove, Metcalf Bottoms, and the Roaring Fork Motor Trail. Picking a trail beforehand and doing some research is the best way to ensure you find the right hike for your adventure. Do you want to see waterfalls? Historic cabins? Mountain views? How difficult would you like your hike to be? Another important part of planning is accounting for how long your hike will take. A good rule of thumb is to estimate that you'll cover 1 mile in about 30 to 35 minutes. So, to have plenty of time to enjoy a 4-mile hike, you'll want to allot around 2 hours. Lastly, bringing food, water, and extra layers for cold or rainy weather is a must this time of year in the Smoky Mountains. Some less crowded, but now less beautiful places to visit are Elkmont, Tremont, Metcalf Bottoms, Greenbrier, Cosby Campground, and Newfound Gap. This level hiking trail meanders alongside a beautiful mountain river and passes by ruins from several historic structures. This peaceful hiking trail begins at Sugarlands Visitor Center and ends on the edge of downtown Gatlinburg. Not only does this trail allow bikes, but also the Gatlinburg Trail is one of the few trails in the park that allow dogs. For stunning panoramic views of changing fall colors, consider exploring Andrews Bald near Clingmans Dome. This hiking trail is only a 4-mile round-trip and yields incredible views of the North Carolina mountains. This trail wanders through beautiful sections of high elevation spruce-fir forests and delivers hikers into a large open meadow with lovely fall wildflowers and a vista where you can see for miles and miles. Another great destination for fall views is the Fire Tower on Mt. Cammerer which can be accessed by hiking the Low Gap Trail from Cosby Campground. This relatively unknown trail can be found behind the Institute at Tremont. Simply park at the school and walk up the hill to the trail head near several other buildings. The 2-mile round-trip hike has some steep rocky sections, but it brings visitors to a lovely 30 FT waterfall with several tiers. Along the way, you can see some awesome mountain views as well! From Tremont, you can also explore more waterfalls on the nearby Middle Prong Trail. This lesser-used trail begins at the Sinks Waterfall near Elkmont. The waterfall itself is a sight to behold in the fall, but you can take this peaceful trail that follows a lovely stream through a quiet part of the mountains. There are several stream crossings and scenic cascades along the way. During late fall, this trail is perfect for snapping pictures of fallen leaves along the streamside. Finding the John Ownby Cabin can be a little tricky due to the twisting network of trails that surround the Sugarlands Visitor Center. Be sure to stop by and consult a ranger at the help desk for a map and directions. This historic cabin was built in 1860 and is only a 1.2-mile loop on the Fighting Creek Nature trail. Another easy cabin hike is the trail to the Walker Sisters Cabin. The hike begins across the bridge from the Metcalf Bottoms Picnic area and passes through the remnants of the historic Little Greenbrier community. 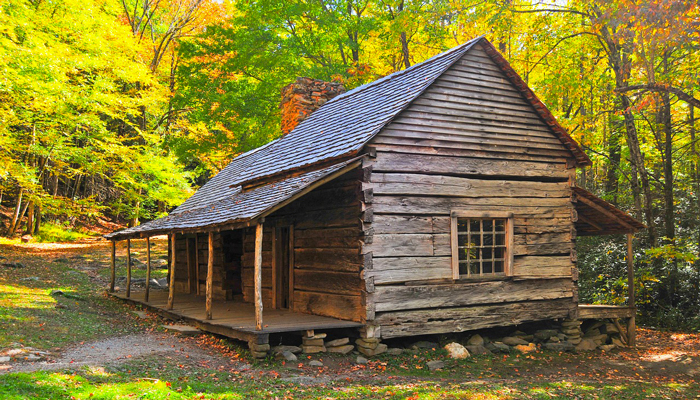 Another nice historic fall hike is the Metcalf Bottoms Trail to the Walker Sister's Cabin. If you're an experienced hiker who wants an athletic challenge, the 14.4 mile round trip up the Bullhead Trail is a great option. This lesser-traveled route to the top of Mt. LeConte offers many beautiful views of the summit and surrounding mountains – a perfect way to see fall in the Smokies. The trailhead begins on Old Sugarlands Trail just off of the Roaring Fork Motor Trail. If you need a shorter route to Mt. LeConte, Alum Cave Trail is only a 10-mile round-trip, but this trail will be especially busy this time of year. Going for scenic drives and hikes in the Smoky Mountains in the fall is surely the best way to experience this beautiful season. Whether you're staying in a Gatlinburg log cabin rental or just visiting for the day, we hope this fall hiking guide gives you some helpful tips to enjoy your visit to the fullest!